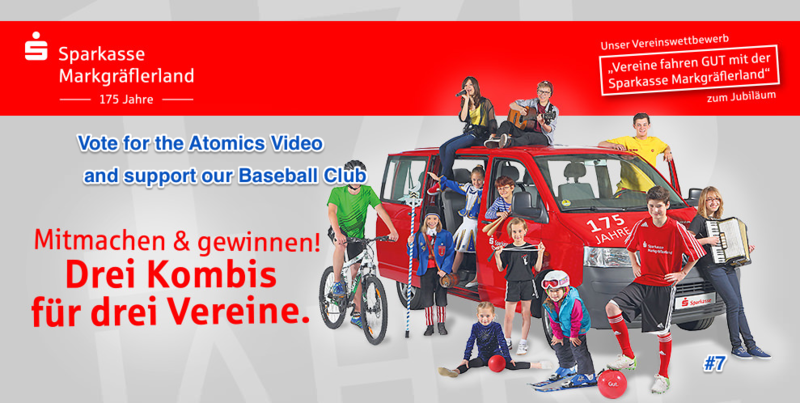 The Neuenburg Atomics are taking part in a video contest with a regional branch of the Sparkasse Bank in order to win 1 of 3 VW vans. The top 3 videos will win the prize and take home a new van to be used for their respective youth programs. After the first round of voting the Atomics are in first place although the competition with the other clubs has been really tough. Now comes the second round of voting and we need all the support we can get. The field has now been narrowed down to only 20 videos and eventually the 10 best will be sent to the bank officials for the final decision. You can find the Atomics video on the following link: (you may have to copy and paste it into your address bar). The voting process works in this way: Once you go to the address listed above, just click on the star below our video. Then a screen will pop up where you can fill in your email address and the security code as shown on the screen. The Sparkasse will then send an email to your address with a link which you can press or can copy and paste into the address bar in your internet browser. Once you’ve done that, a screen will appear which confirms that your vote has been counted. Individuals are aloud to vote once a day with a valid email address and we are counting on the baseball & softball community to do their best to vote every day between the 10th and 16th! Thank you very much for helping our up and coming baseball players win a van so that they can continue to play baseball around our region and represent our club the Atomics way – with hard work, respect, and whole lot of fun! Thank you for your support.